The Pursuing Vintage Shop has some great Christmas items, including some amazing vintage glass ornaments. (Click on the photo to see it in the Shop). Thanks, Barb! Merry Christmas to you! I adore vintage ornaments, we have the 12 days of Christmas and a lot of others. Merry Christmas, Kristen. 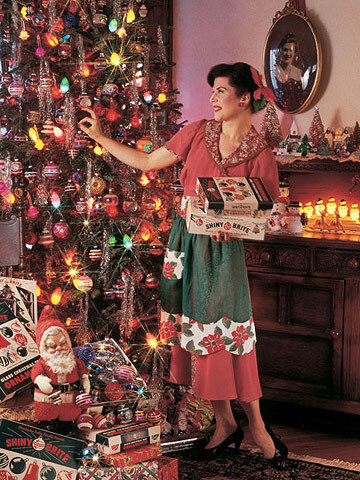 May we all look as fabulous on Christmas morning as that lady in the photo – that apron is hot! I totally wake up looking like that lady allll through the Christmas season! (Not!) I’m going to be on the look-out for a vintage Christmas apron now! Merry Christmas! Kristen I love these vintage ornaments, off to take a look in your shop! Thanks for stopping by, Karena! I was just looking for vintage ornaments to put in a silver bowl – so pretty! Happy Tuesday, Kristen! I love them and just started collecting them this year! i’LL CHECK out your store for sure! Love the ideas here too! Merry Christmas Kristen!